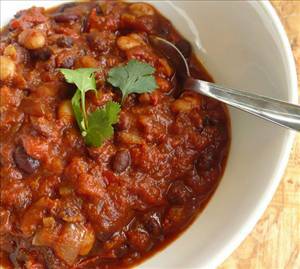 A hot and spicy chili with so much deliciousness, you'll want to share it with your friends. Peel potatoes and dice into small chunks. Chop onion into large pieces, Make sure peppers in blend are into smaller chunks. Spray frying pan with cooking spray and lightly sauté peppers and onions. Frozen vegetables should be completely thawed and raw onions still slightly crunchy. In a large pot, mix in all ingredients except for chili powder and hot sauce. Add water, and cook on low to medium heat until potatoes are soft. When potatoes soften, add chili powder and hot sauce to taste. Cook another 30 minutes on low heat. Serve. Note: this chili (especially if very spicy) is best served sprinkled with shredded colby & monterey jack cheese. Also feel free to experiment with your favorite hot sauce. 118 members have added this recipe to their cookbook. It's amazing =] Enjoy!! My favorite sauce to use in it is called "Temporary Insanity"
There are 370 calories in 1 serving of Southwest Chili. Calorie break-down: 5% fat, 75% carbs, 21% protein.